Danny "Mudcat" Dudeck arrived in Atlanta circa 1989. After making his way inland from Tybee Island, he ingratiated himself as a busker playing blues standards on North Highland Avenue, in front of the same storefront where Blind Willie McTell acted as lay minister in the 1940s and ???50s. These days, Mudcat is a liaison connecting the city's rich Piedmont blues music roots to modern Atlanta's working man's music scene. On the heels of releasing 2016's Mudcat and the Atlanta Horns' debut album, While You Were Away, the singer and guitarist has stepped into the arena of internet radio. 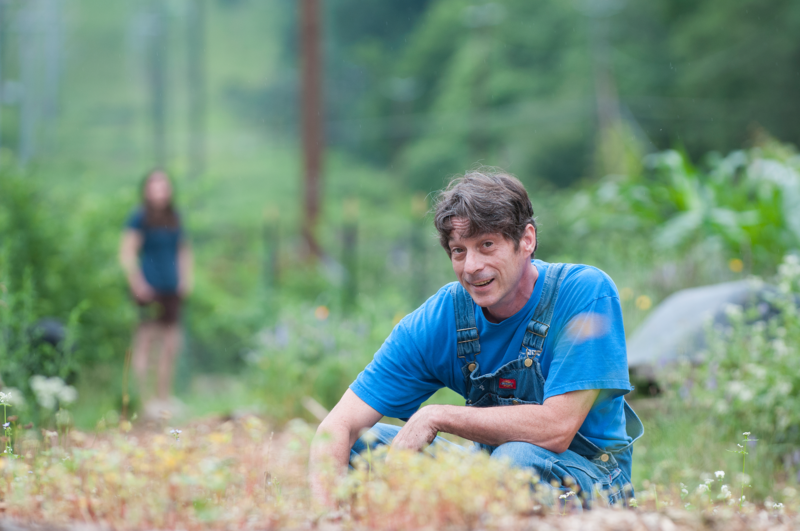 Every Wednesday at 8 p.m., Mudcat hosts "The Piedmont Report" from Hoopoe Acres, the acre-and-a-half farm in Medlock Park he shares with his wife Kathryn near Decatur. Guests ranging from pianist Eddie Tigner and singer Donna Hopkins to guitarist Bill Sheffield have shared their life's experiences related to farming and blues music the topics are often interchangeable. On an overcast Monday afternoon, Mudcat took a few minutes away from tending to his vegetables and chickens to talk about everything from the value of weeds to Dickey Betts' raw slide. So many things were thrown into the pot. In the Delta, people were isolated when they made their blues. When the train came in on the weekends there'd be Charley Patton or Robert Johnson coming through town and everybody got excited! Here in Atlanta, music was everywhere: in clubs and all over in the street. In the Southeast in general there was a lot more interchange between the races and people from elsewhere because there was more tobacco, more crops. Geographically speaking, the Piedmont starts right outside the Appalachian Trail. I'd say Virginia all the way down to west of Atlanta and over to Alabama. Bumble Bee Slim is from the low country right outside of Savannah. Blind "Arthur" Blake ... They say that he's Geechee, but he's the finest Piedmont picker. What is your mission with "The Piedmont Report"? The show has two missions. First is Piedmont blues, or Piedmont music. People all around the world in Europe they call my music Piedmont blues, even when I'm not playing Piedmont blues. I play the blues and I'm from the Piedmont, and I'm influenced by that, so I don't argue. But this show is to give some history about the original artists who recorded it, their influences and to talk about some of the artists who are around now. My other passion is growing food. I want to inspire other people to grow their own food. It could be for my own security: what happens if there's a sunspot or something political goes down and we can't feed ourselves? Also, growing your own food is good for your health and good for your mind. So we talk about what we're growing. Sometimes we give tips, and we have guests read essays about gardening and their personal philosophies. I've followed a Japanese author named Masanobu Fukuoka. He's passed now but the fella who translated and edited his book, The One-Straw Revolution, gave me permission to read from it on the show. It came out in the '70s and it changed my life. He worked for the Japanese government as an agricultural inspector. He looked at a field that had been fallow for about five years and saw how healthy the rice plants were. He realized that by leaving it alone, nature took care of it. When you look at my garden, it looks like a mess not clean and trim. There's no need for that. A lot of times weeds are fixing what's missing. With the guests I bring on we'll talk about that. Eddie Tigner, one of my all time number one favorites, is from a coal mining town in Kentucky. He came on and said, "Food just doesn't taste like it used to." Well, everybody knows that a homegrown tomato, potatoes and beans taste 10 times better than the ones you buy at a store. It's convenient, but we're missing so much flavor. Yeah, mostly because of the lazy people of my generation (laughs). Many generations of Americans are so far removed from an agrarian lifestyle that we don't know any better. It's a stumbling block. How can you like or not like the blues if you've never been exposed to the music? Blues has obvious stereotypes the low down, crying, and so on. People ask, "Why would I want to go to a club and see that?" But over at Northside Tavern I oftentimes see young Georgia Tech students come in, because the club is close to the campus, and I've had some of them say: "I didn't think I liked the blues, but you really brought it to life for me." Do you isolate yourself from other forms of music to flesh out your own rhythms and melodies? Yeah, it's kind of like watching TV, and then commercials come on and you're really compromising your time and your mind and your experience in life. I try to simplify, but I've always got three things going on at once. I've got my big band, I've got my sit down and play acoustic, and I've got this gospel thing. They all overlap, and you'd think you could just do them all the time, but to do them right, I need to think about them separately to develop them. About 20 years ago I went through a phase when I got rid of everything that wasn't straight-up folk kind of music, blues, jazz, country what I felt was pure. I got rid of my Beatles and Allman Brothers records. I got them all back later, but I wanted to get deep into the music. I got to spend some time with Dickey Betts later, so I bought back his records. Of course, everybody around here grew up listening to the Allman Brothers. I'm a slide player, but meeting him, I realized that Duane Allman wasn't my guy. The harmonic minor and the raw slide was all Dickey. I didn't realize that until I was hanging out with him, and it became a gift to get that music back. I'd had the record for 30 years, but now every time I play it, that's what I hear. Which guests on the show have left the strongest impression on you? Honestly it's been kind a passive thing, inviting folks I run into when it feels like there's time. I've known many of these people a long, long time and it's very interesting, and kind of a gift to hear experiences they may rarely tell because of the show's orientation to growing food and exploring the elements of Piedmont music. Bill Sheffield and Ross Pead shared their parallel experiences of coming of age during the segregation era urban vs. rural. People get happy remembering stories of grandparents or parents farming. I've heard some intense and personal performances. The artists feel free and comfortable here. Plus they get eggs! "The Piedmont Report" airs six times each week with new episodes airing every Wednesday at 8 p.m. on Blues 411.